M.A. in Sanskrit (with distinction) in 1964 University of Amsterdam. Ph.D. on the subject Bahuvrihivandvahnika from Patanjali Mahabhasya Guide Prof. Dr. S.D. Joshi. The Ph.D. Degree was awarded in 1971 by University of Poona. The thesis was published by the university of Poona. Was appointed as a reader in Sanskrit at the University of Amsterdam in 1971. Received a Ph.D. degree from the University of Amsterdam in 1981. 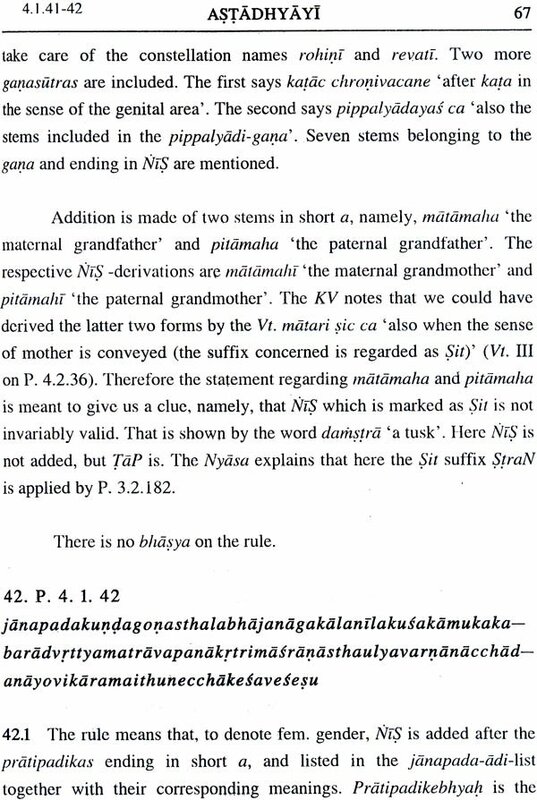 The subject was Mallinatha’s commentary on the Kiratarjuniya Cantos I-VI. The guides were Prof. Dr. A Scharpe University of Amsterdam and Prof. Dr. S.D. Joshi, University of Poona. The thesis was published by E.J. Brill Leiden the Netherlands 1984. Came back to Pune from 1973 to 2010 with the exception of three years in order to continue the work on Sanskrit grammar with Dr. S.D. Joshi with leave of absence for three to four months every year from the University of Amsterdam. The work on the Mahabhasya and on Panini has been published by the University of Pune and the Bhandarkar Oriental Research Institute (Mahabhasya 10 Vols. + 2 Vols.) and by the Sahitya Akademi in Delhi. Gender in the sense of morphologically distinct classes of nouns is known from many languages. The marking of gender plays an important part in the syntax of inflected languages in agreement between nominal’s. Thereby according to the intention of the speaker semantic sub units in an utterance are formally marked for the benefit of the listener to prevent misunderstanding. In Sanskrit like in Greek and Latin we have to make a distinction between words which have a variable gender and those which have a gender of their own an invariable gender. 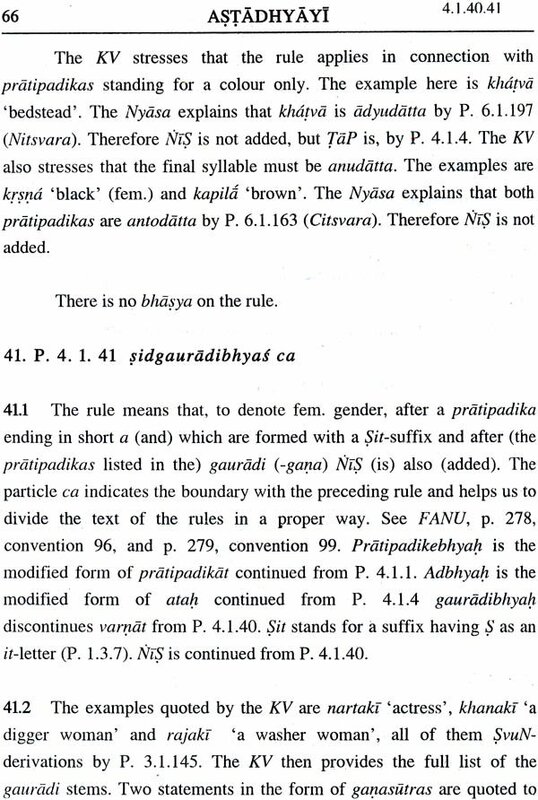 In the Astadhyayi examples of invariable fem gender are noted for instance in P.3.3.94; 4.1.15; 4.1.48. The variable gender words are known as adjectives and they are governed in gender number and case by the words they qualify. 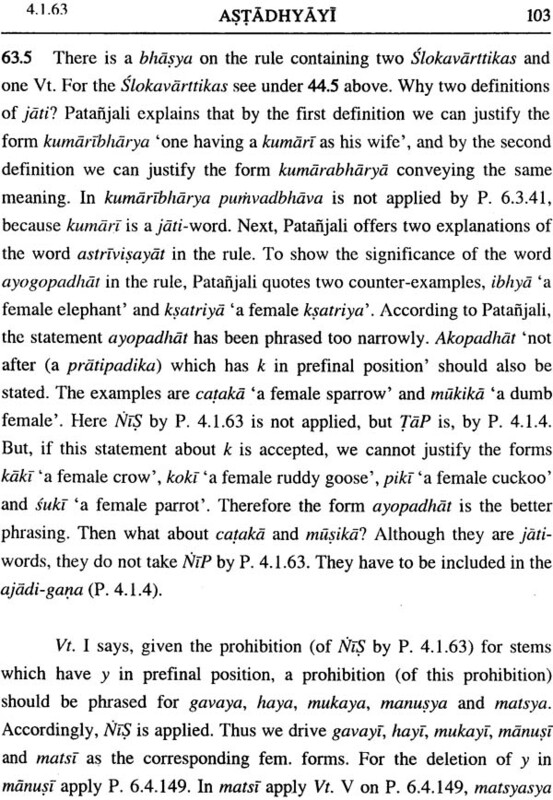 In Sanskrit to indicate fem gender in the case of variable gender words use is made of fem suffixes. That is what the stripratyaya section in the Astadhyayi is about. It comes immediately before the taddhita section because here the knowledge of the fem suffixes is presupposed since the taddhita section to a considerable extent deals with the formation of adjectives. 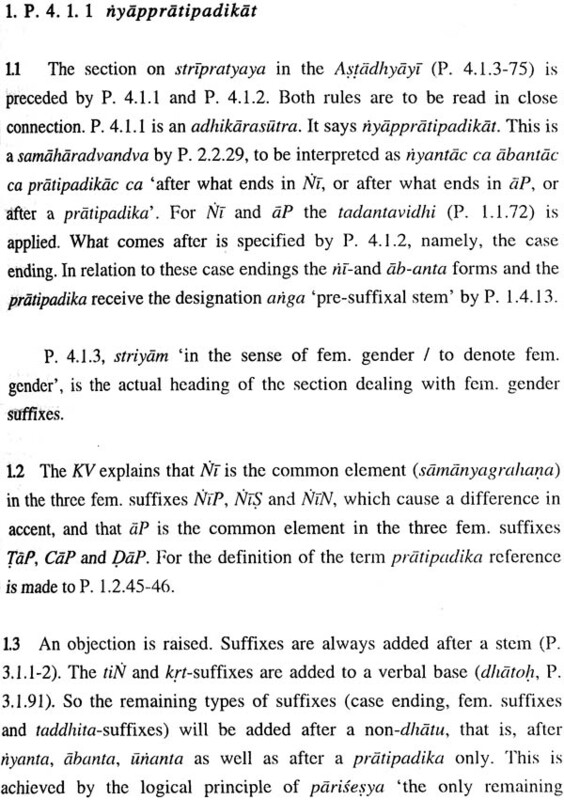 Taddhita suffixes are also added to fem stems ending in Ni or ap examples from the first three padas of the fourth adhyaya are the following. (1) P.4.1.116, kanya, (2) 4.1.127, kulata, (3) P.4.1.148 Nadi (4) P. 4..2., Laksa rocana (5) P. 4.2.22, agrahayani (6) P. 4.2.23 Kalyani (7) P. 4.2.32 dyavaprthivi (8) P. 4.2.83 Sarkara (9) P. 4.2.89 Sikha (10) P. 4.2. 96 (11) P. 4.2.142, Kantha (12) P. 4.3.18 varsa (13) P. 4.3.30 amavasya (15) P. 4.3.34 Sravistha (16) P. 4.3.45 asvayuji (17) P. 4.3.94 tudi etc. (18) P. 4.3.119, Ksudra etc (19) P. 4.3.159 eni (20) P. 4.3.165 Jambii. 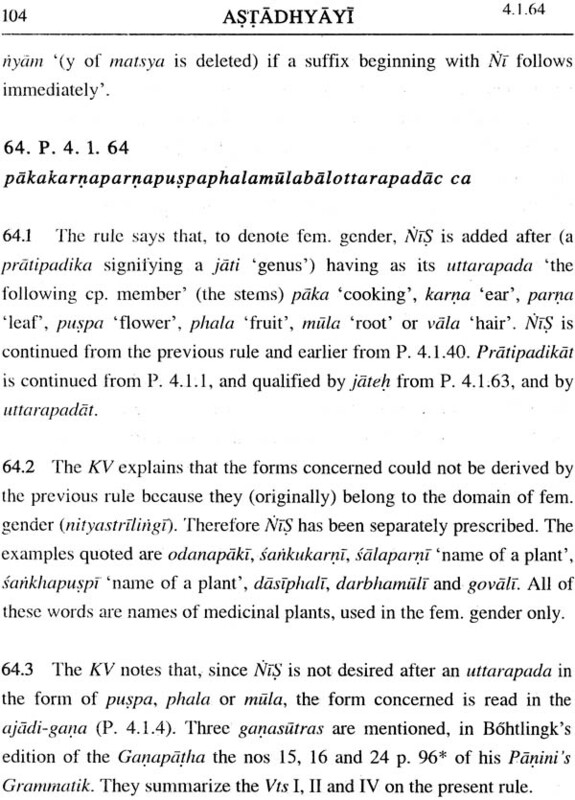 According to a view traditionally known as the pancake pratipadikarthapaksa adopted by late Sanskrit grammarians a fully inflected noun conveys five meaning namely Jati, Class genus vyakti a particular, linga gender samkhya number and karaka syntactic function. Here jati and vyakti belong to concept formation. They are logical not linguistic features although words may be used to denoted them. 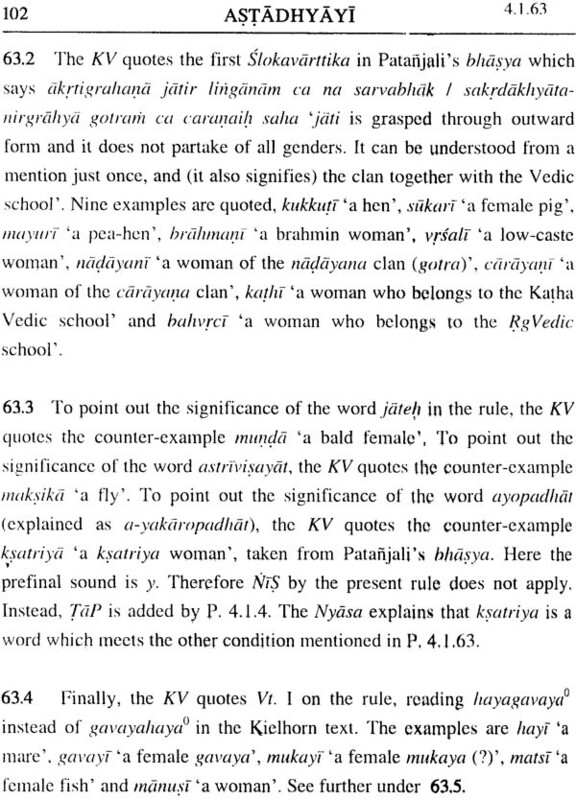 For instance brahmanah is a jati word insofar reference is to a particular class in Indian society. It is also a vyakti word insofar reference is to a particular Brahmin, like Devadatta. The remaining three categories are typically grammatical categories shown in the word from and separately accounted for in the prakriya. They also come in a particular order first we have to decide linga then samkya and case ending specifying karaka. The stripratyaya section comes in between the krt section and the taddhita section in the Astadhyayi. The section proper starts from P. 4.1.3 and contains 73 sutras about 2% of the total number of rules. Out of these sutras 32 have not been commented upon by Patanjali. In his bhasya on this section Patanjali quotes 117 vts. Very unevenly divided among the sutras commented upon and a number of Slokavarttikas or parts of them in his bhasya on P. 4.1.3. 10, 18, 27, 44, 48, 54 and 61. 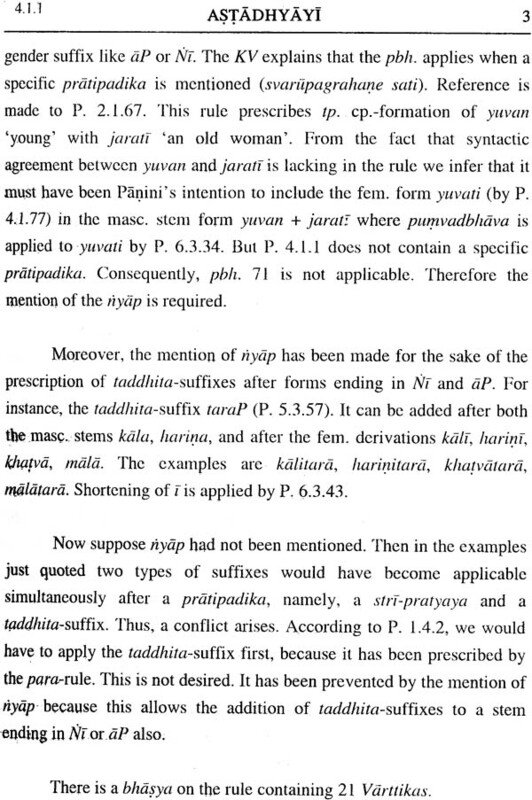 The general condition for the rules dealing with fem gender suffixes is striyam (P. 4.1.3) this rule is preceded by two other sutras. 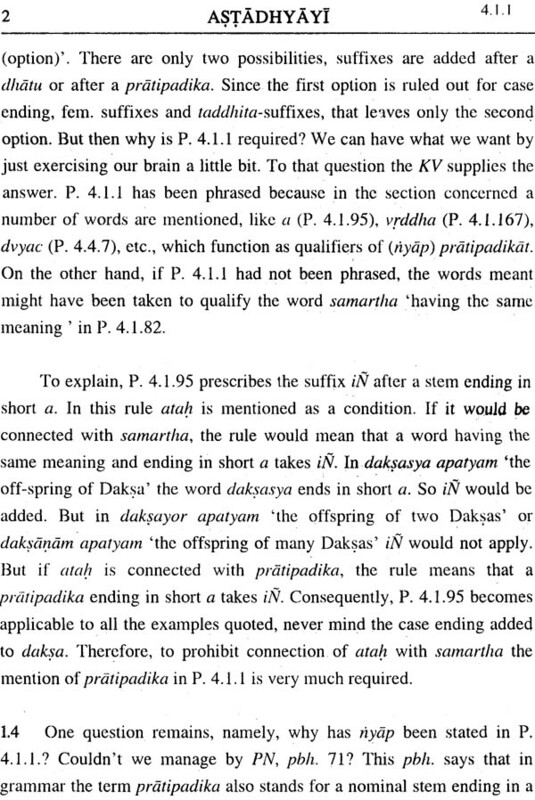 Here P. 4.1.1 is an adhikara sutra. 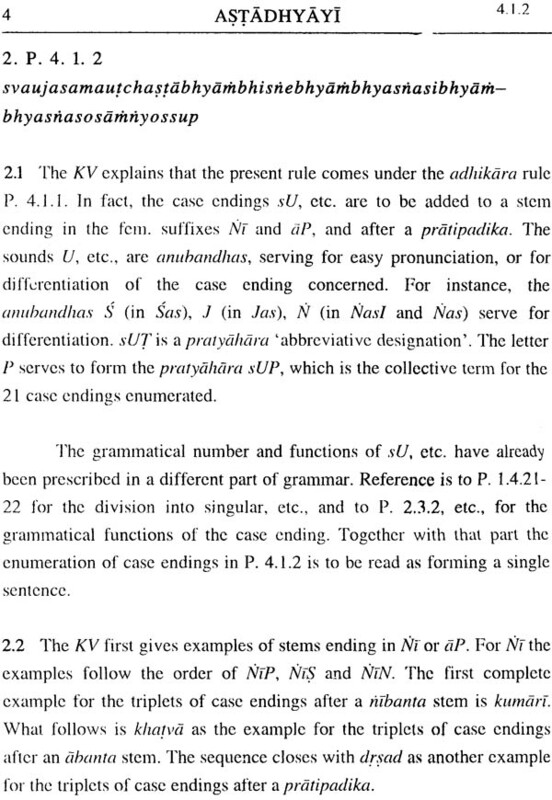 It stipulates that the case endings enumerated by P. 4.1.2 are added after a riyanta form like kumari or after an ab-anta form like mala or after a pratipadika like deva which is neither riyanta nor ab-anta. The main fem suffixes come in two groups indicated as Ni and ap six suffixes in all three for each group. 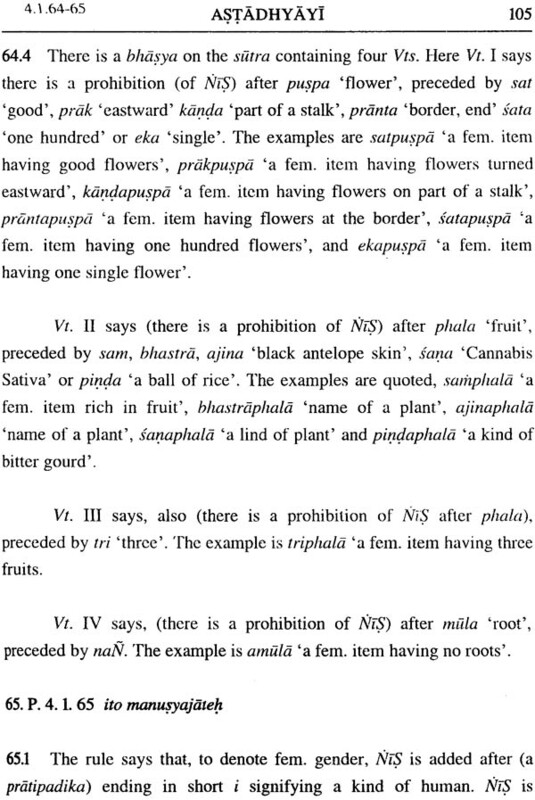 The suffixes in the Ni-group do not cause a formal difference in the pratipadika to which they are added but a difference in accent only. As regards the ap suffixes the important suffix in tap. It is prescribed by just two rules namely. P. 4.1.4 which says that tap is added after a nominal stems listed in the ajadi gana and after nominal stems ending in short a and P.4.1.9 especially for pada in connection with rc. The other suffixes in the ap-group are cap (P. 4.1.74-75 by way of exception to nin) and dap (P. 4.1.12-13 by way of exception to Nip.